The Scoobies get that old "school spirit" when they visit the reputedly haunted old Lambertville High School, and then stumble across the empty, magnificent Gulick House- an endangered historic treasure from days gone by! What follows is THE most comprehensive tour of Lambertville ever seen before (including video mpeg footage)... join us as we explore this spooky infamous spot (and don't forget to check out the pics from our first Lambertville trip as well)! I had gotten an inside tip from a Lambertville contact who told me that the demolition of the school had been scheduled to make way for some new condos, so we decided that we'd better get up there and get as many pics as we could, while we still could! The Scoobs convened at my place early that Sunday morning, ready for a day of adventure and fun. We loaded up the Shady Lady, grabbed our maps and cameras, and hit the road. 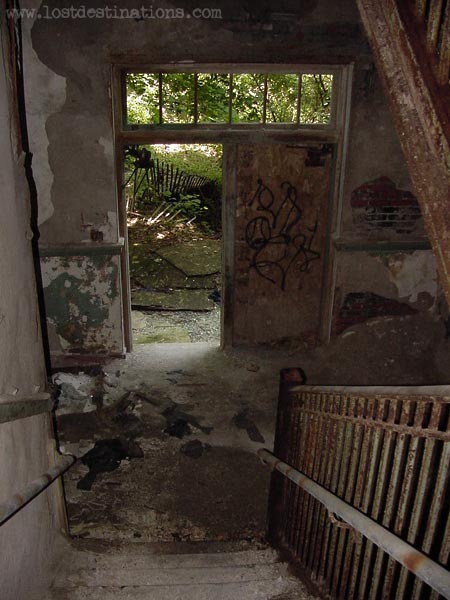 Click here for a live-action sneak-peek vid clip of the spooky entrance to Lambertville High!